2) Run the Houdini Setup. 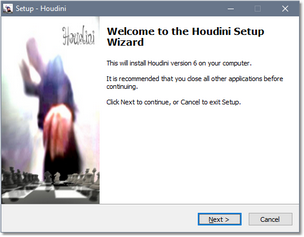 All the Houdini files will now have been installed on your hard disk in the folder "C:\Program Files\Houdini 6 Chess". 3) Download the Arena Setup from http://www.playwitharena.com. 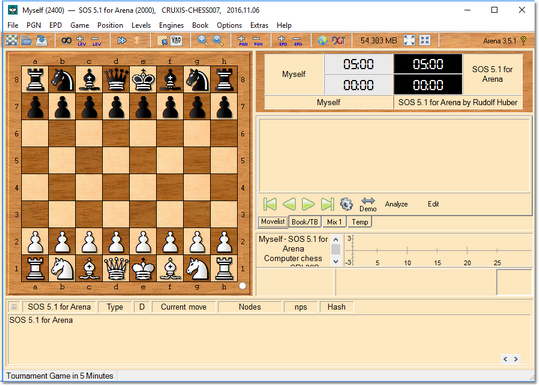 Go to the Downloads page and select the most recent "Arena Setup" package - at the time of writing this is "Arena 3.5.1 Setup". All the default installation options are OK, just click the "Next" button. At the end of the set-up you'll automatically run Arena. After selecting your language, you'll find the main screen of Arena. Click on the "Engines" menu, select "Install New Engine...". 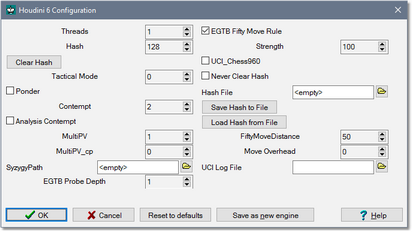 A file selection dialog opens, go the "C:\Program Files\Houdini 6 Chess" folder and select the "Houdini 6.exe" file. Arena will then offer the choice between "UCI" and "Winboard", simply click OK to keep the default UCI. Arena will start the Houdini engine. 7) Congratulations, you've successfully installed Houdini in Arena! You can now play games or run analyses. 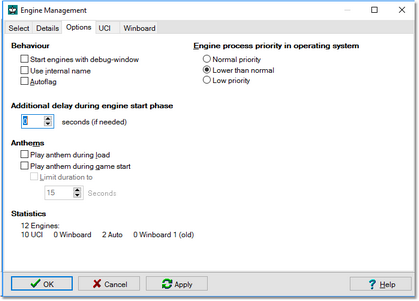 A) Click on the "Engines" menu, select "Manage...", the Engine Management window pops up. Go to the "Options" tab and select the "Lower than Normal" option in the "Engine process priority in operating system" group. 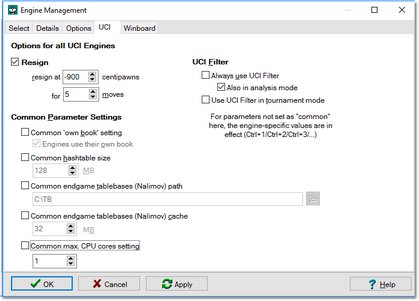 B) Remove all the "Common Parameters Settings" in the "UCI" tab so that you can configure individual settings for all engines. C) Disable the "Ponder" option in the Engines menu. Ponder a.k.a. "permanent brain" does not work very well for UCI engines in Arena. D) If you want to play games against the engine, adapt the Strength of Houdini to match your skill level. 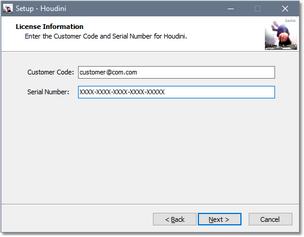 Right-click on the bottom part of the Arena window and select the "Configure Houdini 6" option (or press CTRL-1). By default the Strength option is at 100 (full strength), you can try to adapt this value so that you get competitive games. What is the highest strength level that you can consistently beat? P.S. Don't forget to switch the Strength back to 100 when analyzing positions.